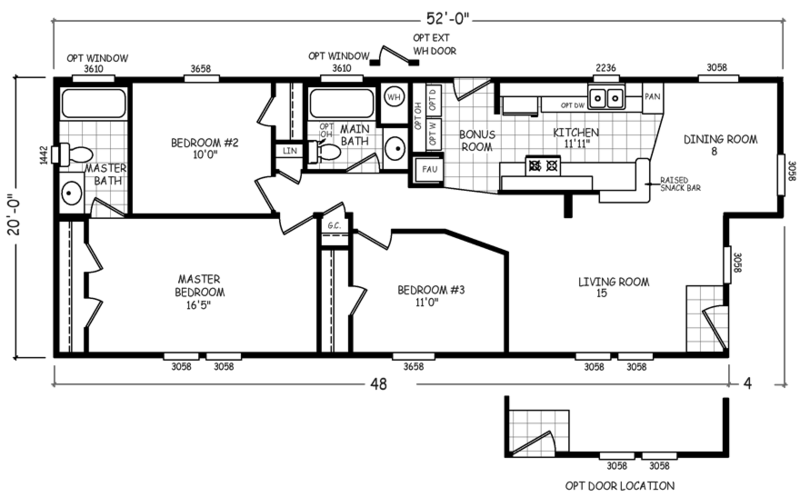 The Manitou model has 3 Beds and 2 Baths. This 1000 square foot Double Wide home is available for delivery in Arizona, California, Nevada, New Mexico, Colorado, Utah. There are so many wonderful features in the Manitou model that it’s difficult to focus on just one. As a starting point, and at the heart of it all, is the pleasing layout. Every room is thoughtfully arranged and configured to accommodate each household member. The spacious living room is cleverly integrated with the dining room and a guest closet awaits at the end of the long hallway. As an added benefit, the kitchen features a raised snack bar that is perfect for socializing. If pictures are shown, they may depict upgrades and options that are not included within the base price of the home. Ask your housing consultant for details about the other great features that come standard on the Manitou manufactured home.